Home > Featured > Cruising is More Fun with Segway! My first time using this amazing machine was back in Singapore. 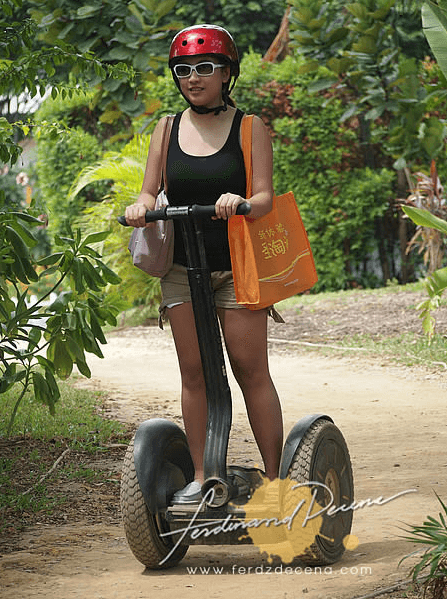 It was very cool cruising around Singaporeâ€™s famous resort attractions with this very light and easy to use gadget / machine / automobile? Sometimes I donâ€™t know how to call or categorize this cool tool! I made my research of course and it is called the SegwayÂ® Personal Transporter (PT), the worldâ€™s first and only electric, two-wheeled, self-balancing transportation device which was first introduced to the public on â€œGood Morning America in 2002â€, and is now available in the Philippines. Unlike a car, the Segway PT has two wheels. However, it does not carry the same risk as rollerblading or skateboarding through the streets. Segway stays upright by itself, and movement is totally controlled by the rider by leaning slightly forward or backward, and leaning on the Lean Steer frame to turn left or right. You get the sense of power and speed, yet feel a sense of safety and absolute control. It all feels natural, safe, and instinctive. Surprisingly, it can go uphill up to 35 degrees, can withstand up to 1-2 inches of water and can go on any terrain! I can attest to this because I tested Segway in a rocky terrain in Singapore and in a rainy weather here in the Philippines! Segway is ideal for people who love outdoor adventures, or city-living individuals who live in big subdivisions or work in big companies who need to go easily in and out, from one building to another. I can see this being used in schools too like Ateneo, UP and DLSU. It is also perfect for business owners of resorts and tour businesses as well as establishments who need patrolling or fast response to emergencies. Less gas to buy â€“ you donâ€™t have to use your car all the time to buy 3 blocks away from that convenient store. You can also take it to places without much noise and pollution. It is also very economical because Segway can travel as far as 40km on a single battery charge. A full charge is only 1 kilowatt which costs only a little aboe P8 and takes around 6 hours to complete. Less pollution, more savings, better lungs sweet deal! You can also contact Simply Moving Philippines at Nissan Motor Philippines, 1232 UN Avenue, Paco, Metro Manila.